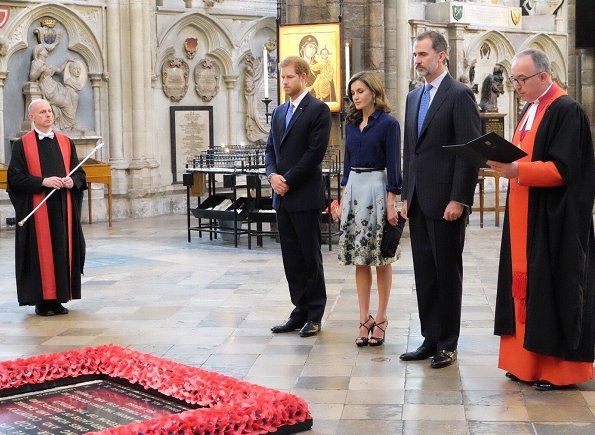 On the second day of their visit to England, King Felipe VI and his wife Queen Letizia, accompanied by Prince Harry visited the Westminster Abbey on July 13, 2017 in London. 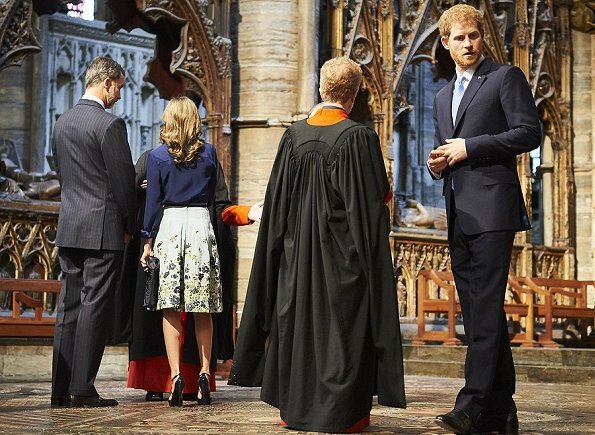 The Queen wore a Carolina Herrera silk taffeta blouse, and flower party skirt. Nice. Except for the rolled-up sleeves. Earrings are the perfect compliment to Queen Letizia's look! So we had yellow (Spanish flag), red (Spanish flag,Union Jack) and blue (Union Jack). Are we in for a new white gala gown tonight? That's the only national colour which is left. This flowery skirt is among my all time favourites. Yes, I loved that skirt when I first saw it a while ago. Imagine the work to apply those flowers! It really suits her so well, and she looks so much more herself without the yellow hat she wore. I like the more casual look of the dark shirt's rolled sleeves. She looks classy and beautiful as always. A typically stylish but practical look from Letizia. The skirt is pretty, the shirt works well, accessories are spot on and the soft curls in her hair are very flattering. I never get tired of seeing this outfit, elegant, modern and royal, these types of skirts are ideal for her figure, the rolled sleeves look very sloppy, if one must do it, it should be done with care. Love the earrings, within the color hue but not matchy-matchy. Although I prefer the bob, I do like the way it looks today, with volume and soft curls, clasic and modern at the same time. And of course the killer sandals, olé for Letizia for being herself. Letizia could give lessons in becoming a royal princess and then a Queen. I remember the fuss when she first appeared about "the common journalist". She has proved the negative voices wrong. While this is a great look, I wanted to see something new for a state visit. I want that skirt!!!! That said, I think this is maybe a little bit too casual for the occasion but perhaps there were other events before and after that made this the right choice..
She looks lovely, anyway, as usual. A fuller skirt is a great silhouette for Letizia. The belt is superfluous and twisting out of place. I often don't care for her shoes and this is no exception. I understand she is a petite woman but her sky-high spike heels and platform shoes make her look like a Barbie. Letizia no es pequeña, mide 1,70 cm y jamás será una Barbie, pues desde muy joven supo ganarse la vida, tener éxito profesional y nunca fue una mujer-florero. Es una reina maravillosa, como se ha demostrado en estos días en UK. How does she wear heals that high and not stumble ! That's an art form ! Love the skirt ! Another polished look from Letizia. she always looks polished and well engaged, her shoe collection is to die for! !